It is incredible to think that air travel has only been a part of our lives for 113 years; today we couldn’t imagine our lives without it. Air travel has allowed the world to develop in ways we would have never imagined, linking countries and cultures 24 hours a day, enabling global economies to boom and bringing people from all far stretches of the globe closer together. Mankind’s conquest of the air has seen many memorable firsts, below are ten of the most memorable. Perhaps the most well-known first on this list is the first ever flight, undertaken by brothers Orville and Wilbur Wright. 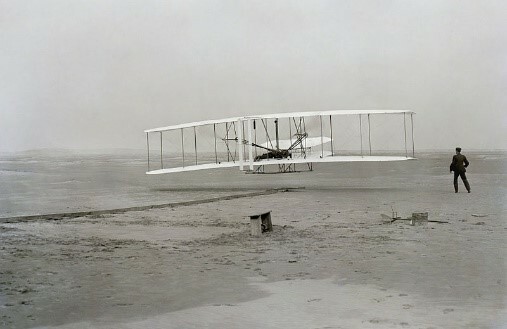 The world’s first powered aircraft, the Wright Flyer, took off from the beach at Kitty Hawk, North Carolina, on 17 December 1903. In 1909, the Daily Mail offered a £1000 prize to anyone who could fly across the English Channel by the end of the year. Later that year, Frenchman Louis Bleriot successfully made the first flight in a heavier than air aircraft winning the prize. The Morane Saulnier L was the first fighter plane used during World War I when one was fitted with a machine gun as well as metal plates on the propeller to deflect bullets, making it the first vehicle that could do combat in the air. Aviators John Alcock and Arthur Brown became the first people to fly across the Atlantic in 1919, flying non-stop from Newfoundland to Ireland in their Vickers Vimy, a modified First World War bomber. The first round-the-world flight took place in 1924, when four Douglas World Cruisers, specially made for the task, managed to circumnavigate the globe in 175 days, making 74 stops and covering 27,550 miles. A new leap forward in aviation design took place in 1936, when Germany’s Focke Wulf’s FW 161 became the first operational helicopter. The Heinkel He-178 became the first turbo-jet powered aircraft to fly, marking the beginning of a new age of aviation. Future astronaut Chuck Yeager was the first to break the sound barrier – 800mph – in 1946 in the experimental Bell X-1 rocket plane, reaching speeds of almost 1000mph. Great Britain created the first jet airliner in 1949, the De Havilland Comet. The airliner was set to achieve great things, however, it was stopped in its tracks by a serious of catastrophic accidents that no aircraft maintenance support at the time could fix. Though the first plane to break the sound barrier was the Bell X-1, the first commercial supersonic airliner didn’t fly until 1968. The Soviet’s Tupolev Tu-144, one of the only two supersonic airliners to enter commercial service, began flying a whole 8 years before Concorde.